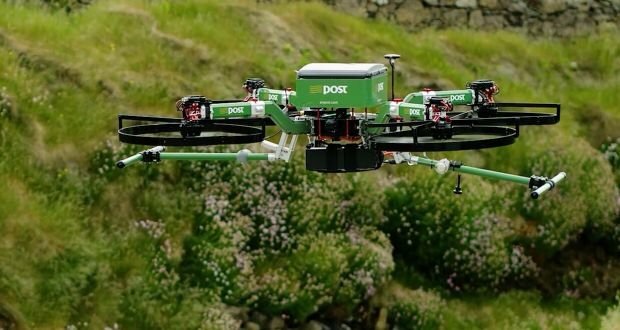 This was the first autonomous delivery flight authorized in Europe. It was also the first time that a flight by an unmanned aircraft was performed outside of the pilot’s field of vision (i.e. beyond visual line of sight or BVLS) on a real-life mission. DHL Parcelcopter (“Paketkopter” in German). To provide emergency delivery of medications (and other small goods) via regular flights from the seaside village of Norddeich to the North Sea island of Juist in Germany on days when the regular ferry does not operate. The parcelcopter is a small, rotary-bladed UAV that weighs approximately 5 kg (11 lb) and has an autopilot as well as automated takeoff and landing functions. It can carry a payload of 1.2 kg (2.6 lb). Route (one-way) is approximately 12 kilometers (7.5 miles). The Parcelcopter can remain aloft for 45 minutes. At 5o meter (164 feet) altitude, can fly at 18 meters/second (40 mph) depending on wind speed. What are your thoughts on the DHL Parcelcopter? Comment below!